You are here: Home › Further Reading › JFK Assassination FAQs › Who Were the Three Tramps in Dealey Plaza? Plenty of people were mistakenly named as the three tramps before the discovery in 1992 of their arrest records revealed that they were in fact just three ordinary tramps who were in the wrong place at the wrong time. In 1966, a JFK assassination researcher, Richard E. Sprague, came across seven unpublished newspaper photographs that had been taken in Dealey Plaza between 2:20 and 2:30pm on 22 November 1963. The photographs documented an event that was known from the testimony of two law enforcement officers but otherwise unreported: the arrest of three men in the railway yards behind Dealey Plaza. The photographs depicted the three men being escorted by two or three armed policemen past the Texas School Book Depository and across Houston Street to the Sheriff’s office. The testimony of David V. Harkness, the police sergeant who led the search of the stationary freight train: Warren Commission Hearings , vol.6, p.312. A statement made on 26 November 1963 by Deputy Sheriff Harold E. Elkins, acknowledging the receipt of three arrested men from the railway yard and the transfer of the men to Captain Fritz of the Dallas police: Warren Commission Hearings , vol.19, p.540 (Decker Exhibit no.5323). When questioned by researchers, the authorities were unable to produce any records of the arrests. Nor were the authorities able to produce any reason why no records existed. The men’s identities, and their fate, were unknown. Although the men wore scruffy clothes, they were clean–shaven, and the two that were not wearing a hat had neat haircuts. Their incongruous appearance, combined with the lack of documentation, generated suspicions that the three men were not genuine tramps. Perhaps they had been involved in the assassination, and perhaps the Dallas police were complicit in allowing the men to flee the scene of the crime. Conspirators would hardly have drawn attention to themselves by being escorted by armed policemen. The rail yards behind Dealey Plaza allowed several routes of escape that would have avoided the many bystanders and press photographers who remained outside the main entrance to the Texas School Book Depository. For links to maps of Dealey Plaza and the locations of witnesses, see Grassy Knoll Witnesses. Charles Harrelson, a convicted murderer and the father of the actor Woody Harrelson, claimed to have participated in the assassination, and was supposed to have been the tallest of the three tramps. Chauncey Holt, a professional con–man, managed to fool some of the more credulous conspiracy theorists with his claim to have been involved in the assassination. He was supposed to have been the third tramp, the one wearing a hat. E. Howard Hunt became known to the public in the early 1970s as a conspirator in the Watergate scandal. Some conspiracy theorists, like religious believers who are able to see the face of their favoured deity in a stale burrito, saw Hunt’s face in the Dealey Plaza tramp photographs. Hunt too was alleged to have been the tramp in the hat. Frank Sturgis, another Watergate conspirator, was also identified as the tallest tramp. Thomas Vallee, who had been arrested in Chicago on the day of President Kennedy’s proposed visit to that city three weeks earlier, was another suspect. 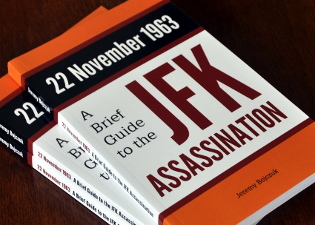 As a result of the growing interest in the assassination generated by Oliver Stone’s film, JFK , many previously secret documents were made available to the public. The most important were of course those relating to the impersonation of Lee Harvey Oswald in Mexico City, a central event in the assassination story and one that forced the official adoption of the lone–assassin narrative. Gus W. Abrams, aged 53, of no fixed abode, the tramp in the hat. Abrams had died in 1987, but Gedney and Doyle both confirmed that they had indeed been the men in the photographs. They had spent the previous night in a nearby homeless people’s hostel, where they had been able to wash and shave. Bureaucratic failings allowed the three tramps in Dealey Plaza to remain unidentified for nearly 30 years after the assassination. The desire of some observers to see a conspiracy in every uncertain aspect of the case allowed all sorts of implausible suppositions to arise. The suggestion that the tramps may not have been what they seemed was promoted by Jim Garrison, and repeated by Oliver Stone in his film, JFK . The identities of the tramps were revealed soon after the film began to be shown, which allowed critics to seize on it as an example of factual errors in the film. The case of the Dealey Plaza tramps was not the only instance when ambiguities in the evidence were misused by conspiracy theorists in a way that allowed their opponents to ignore or misrepresent the stronger arguments for conspiracy. Two prominent examples are the claim that the Zapruder film has been faked, and the argument that President Kennedy’s body was altered to fool the pathologists at the autopsy. Ray La Fontaine and Mary La Fontaine, ‘First Look at Dallas JFK Files’, Houston Post , 2 February 1992. The La Fontaines were the first to examine the arrest records, and went on to track down and interview John Gedney and Harold Doyle. The House Select Committee on Assassinations in the late 1970s discussed the merits of candidates such as E. Howard Hunt, and concluded that almost all of the claims were unfounded. See HSCA Report , appendix vol.6, pp.257–273; the seven photographs are reproduced on pp.267–270. Richard Trask, Pictures of the Pain: Photography and the Assassination of President John F. Kennedy , Yeoman Press, 1994, pp.338–347, gives a comprehensive account of the issue and contains good reproductions of two of the Dealey Plaza tramp photographs. Trask also describes the experiences of the three news photographers: William Allen of the Dallas Times–Herald , Jack Beers of the Dallas Morning News , and George Smith of the Fort Worth Star–Telegram . Robin Unger’s JFK Assassination Photo Gallery includes some of the images taken by William Allen and Jack Beers. Richard E. Sprague, the businessman who researched the photographic aspects of the JFK assassination, is not the same person as Richard A. Sprague, the prosecutor from Philadelphia who was appointed chief counsel to the HSCA, only to be replaced by Robert Blakey. How Thorough Was the Warren Commission’s Investigation?